I have a 2-year-old daughter, Shiho who goes to nursery on weekdays. If both parents work in Japan, they usually fight for limited seats available in nurseries. Luckily my daughter has gone to one since she was 6-months old. Nurseries are available until they start elementary school at age 6. Great thing about nurseries is they feed kids lunches and snacks prepared by qualified nutritionist. I must admit her diet is much healthier and perhaps more appropriate for the age than the stuff I cook. Nonetheless, I try my best to prepare delicious breakfast for her (and my husband of course) when only time all three of us sit around the table together on weekdays. Though many people prefer 'Western' style breakfast and cannot wake up without their coffee these days, my family still prefers 'ordinary' style in the morning which consists of a bit of different dishes on the table, generally. Rice and miso (soya-based) soup (seaweed, tofu & leeks usually go into this) is a must. 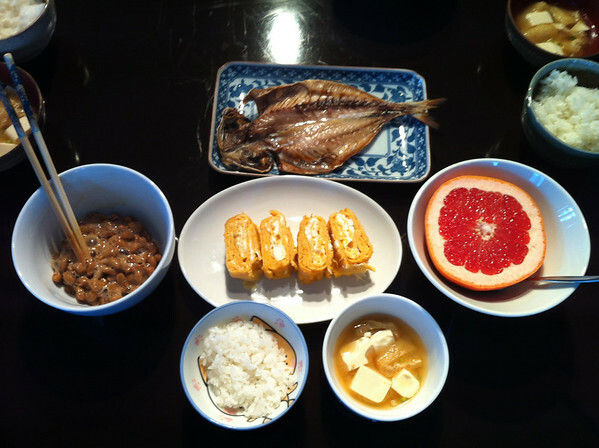 In addition, we usually have some proteins, in this case Japanese-style omelette with bonito flakes, fermented beans, and also some baked fish (usually a type of mackerel or salmon). Grapefruits is her most favourite fruit so routinely comes up on the table. The photo seems a bit too much for 2-year-old girl, but it is shared with my husband and myself apart from rice & soup. We have own bowls for those. Although preparing such breakfast seems a hard work at 6 am in the morning, it is in fact quite easy. Five-minutes to grill the fish, mix the beans with soy sauce, and prepare omelette & soup in between take about 10 minutes. Rice cooker does its work before I wake up. Pieces of rice stuck on her face and clothes: about 20. This looks great and quite healthy. How long do you spend eating your breakfast? We spend about 15-20 minutes, including feeding her & myself. Not a lot of time! This looks delicious (apart from the fermented beans - I don't much care for the texture of natto)! I used to live in Japan, and I quickly came to love this kind of traditional breakfast. In the States, I've always found a lot of breakfast food to be too greasy or too sweet, so I never ate much for breakfast. So for me, enjoying the more savory Japanese breakfast really encouraged me to start my day healthier! What a lovely breakfast! I much prefer savoury breakfasts too and will choose a rice and fish based meal over more typical breakfasts when I can. One of the joys I have when travelling is experiencing local food. My husband lived in Helsinki, Finland for 6 months until April this year and breakfast for me when visiting was smoked fish, cheese and rye bread. In Egypt the resort we were at had an amazing breakfast buffet with smoked salmon and smoked meats as well as the usual western fare but my favourite was Ful Medames, stewed fava beans with the local flat bread. Your breakfast looks perfect to me! I have never tried natto but hope to one day. Your family is very lucky to have such a delicious breakfast! Good Morning 志保 and あすか what a lovely breakfast and looks like it will be a delight to eat, even that early in the morning. I do like as mentioned in previous posts the additional 'pieces of' comments and the 2 added to this blog have me smiling, brilliant. I've heard the fermented beans (Natto?) are really good for you but an acquired taste. What do they taste like? You are absolutely correct! It is sticky and rather smelly thing so you may not like it for the first time -definitely an acquired taste. It's not too salty. Putting it on rice maximise the taste & you can enjoy the texture, too. My husband used to avoid it till Shiho starts to eat, but now as he does not want to be left out at the table, he eats it and in fact addicted to it! Low calorie, low price, no preparation. Somehow my skin is in better condition on the day I eat it than the day I do not. I absolutely agree with you Asuka in that it's brilliant to see what people eat in different parts of the world! Even in Europe meals can be very different from one country to the next. I love finding out about breakfast especially as it's my favourite meal of the day, so thanks for sharing your Japanese breakfast with us, I found it really interesting (and looks delicious). Dear VEG, thx for this breakfast posts, I love it. @Asuka: thx for sharing this. I'm very interested in asian meals, especially in breakfast :) But what about Onigiri? I thought, it is a typical japanese breakfast. As an American, I couldn't do this for breakfast....but boy it looks like a fantastic lunch or dinner!!!! Such an interesting breakfast! I used to eat savoury breakfast when I was a kid, but now we tend to have cereal or other sugary stuff due to lack of time (and laziness :)). I am sure it is great to start the day with a family meal. I think that would be a wonderful idea for my family too. My mom's Japanese, so I grew up on rice, fish and miso soup, though I've only eaten it for breakfast once in a while. I love tamagoyaki. My grandparents eat natto, but I can't get past the smell honestly. Definitely an acquired taste. When we would fly back and forth between the US and Singapore we often spent the night in Narita, where Tokyo International Airport is. We always stayed at one particular hotel and they had a breakfast buffet from here to eternity with every food imaginable. My brother and I (and our friends when they stayed at the same hotel) always made a oit to have french fries for breakfast. Mostly just because we could. That should say "made a point". I wish I had someone to cook me a traditional Japanese breakfast, it looks delicious! I was lucky enough to spend a week and a half in Japan as an exchange studen many years ago. This post has me missing the breakfasts I had there. It looks fabulous! This looks amazing! Takes me back to Tokyo! I think this looks delicious, I really liked the Japanese meals I ate when I was in Tokyo.